UAC is expected to weaken, and be effective in a reduced area on Sunday. Trough will fizzle out to restricted system. As the system will move West, it will resultantly reduce the quantum of rains in Sindh from Sunday, which will be less than Saturday. For Sunday, Coastal Sindh will get more rainfall compared to interior . Rains over Muscat will continue for a day more on Sunday. UAC now lies off the Sindh Coast, and in elongation, spreads as a trough upto Oman Coast..the coastal rains in Sindh are associated with this trough now...trough is expected to move West/ SW towards Oman. Rains expected in Muscat. Karachi, Nawabshah and Sukkur can expect 1 more day of rains on Sunday Heavy falls in Karachi tonite. Good, after a 6.6 mms closing for July at Karachi AP ! Overnite, Larkana measured a good 56 mms of rain and Sukkur 16 mms, much needed rains ! Substantial Decrease in rainfall in Gujarat and Central India and Interior Maharashtra. As the axis moves North, Monday onwards, rainfall increases in Hills of Northern India. States with heavy rainfall will be Uttarakhand and HP. Nepal too gets heavy precipitation from Monday. UAC, moving Westwards from Gujarat, will bring fairly good rainfall into Sindh region of Pakistan and rest of Pakistan also gets moderate rains. Coastal Sindh will benefit also. Some pockets of Sindh get the heavy thunder shower. Most Sindh and Balochistan cities get much needed rainfall. Karachi, Nawabshah and Sukkur or vicinity can get a heavy shower. Can expect 25-35 mms rainfall. Rainfall decreases from Monday . 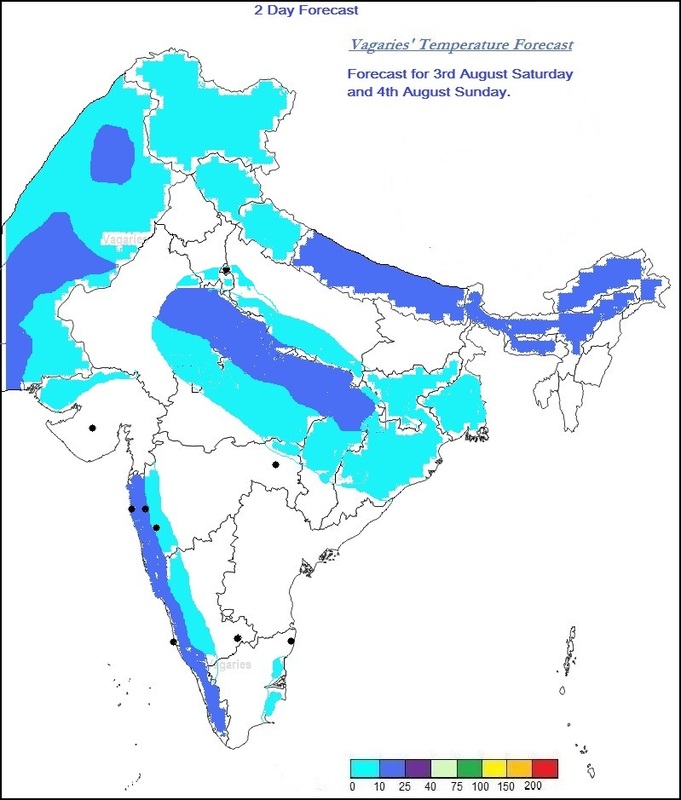 On the Indian side, the axis remains (weak) over Central India, and the regions shown in the map get the moderate rains (Blue colour). Almost negligible rain in regions shown without shading. Mumbai sees 3/4 showers of medium intensity in different parts, and interspersed with sunny intervals. Saturday rainfall may be around 10 mms. Lesser rainfall with sunny spells on Sunday. Rise in day temperatures. Surat will see a decrease in rains from Saturday, with days getting warmer. Delhi NCR will be partly cloudy, with the odd shower in some parts. Days around 34c. Some marginal increase on Sunday night thru Monday. After Monday, rainfall restricted to the Hills. Kolkata can get some passing showers, with <10 mms. But, the days will be warmer at 35c. Chennai can get thunder showers in some parts on Sunday night. Strong NW winds. Bangalore will be cool and cloudy. Light rains likely in some parts. No significant increase. not a drop since last 36 hours. I think around 4 lakh cusec of water is flowing in Mahanadi,in sambalpur. Thanks Rajesh sir, Rohit for good information. We can see that entire south east Karnataka has received very low rain.. what ever we see is from start of monsoon and no improvement. I have noticed this same pattern for last 3 years and this region is very close / infact merges with Rayalseema and interior TN, therefor it is tending towards desertification. Infact these regions will not even receive rains in sept and very negligible NEM. Many cities and agricultural areas are in this zone. Even if we randomly pickup least rain place from Marathwada for instance Augrangabad - 500mm is more than any of these places. North KAR many places like bagalkot,raichur,bagalkot,bellary also have received less rain but only saving grace is depression/lows over MAHA/Marathwada can bring some generous rain to them. The rainfall data you have put forwarded about those in Karnataka, AP, TN is rather climatology of the area during SWM. TN rainfall during this period [01.06.2013 to 31.07.2013] is around 9 or 10 cm only. This is the recent rainfall data for Cauvery Basin. Has a new UAC formed in the BOB sometime back?? Dear Villi - with respects for your weather knowledge-> myself as common person has observed change in SE interior KAR -> definite change on monsoon pattern/environment - these places are not even receiving 50% of normal rain. Principal Component Regression - is one of the estimation techniques used for data mining -> weather predictions too use this model -> principal component analysis is used for data reduction. Morbe dam requires just one round of heavy rains to spill over. 10 meters to go. Second time its reaches this height after commissioning few years back. Under Navi Mumbai municipal corporation its a dam over a large area at the matheran foothills.